Leadership communication is an interesting topic. We all know that the ability to communicate appropriately is an essential component for every effective leader. Ken Blanchard and Associates reports that 43% of survey respondents identified communication skills as the most critical leadership skill set, while 41% identified the inappropriate use of communication as the number one mistake leaders make. http://www.kenblanchard.com/img/pub/pdf_critical_leadership_skills.pdf. But it is not just communication that matters. Leaders by definition move people from one place to another – they create change or movement. This requires the leader be able to articulate the goal, the direction and reason for the change. This means the leader must be a compelling communicator. The skill of being a compelling communicator is seldom taught. 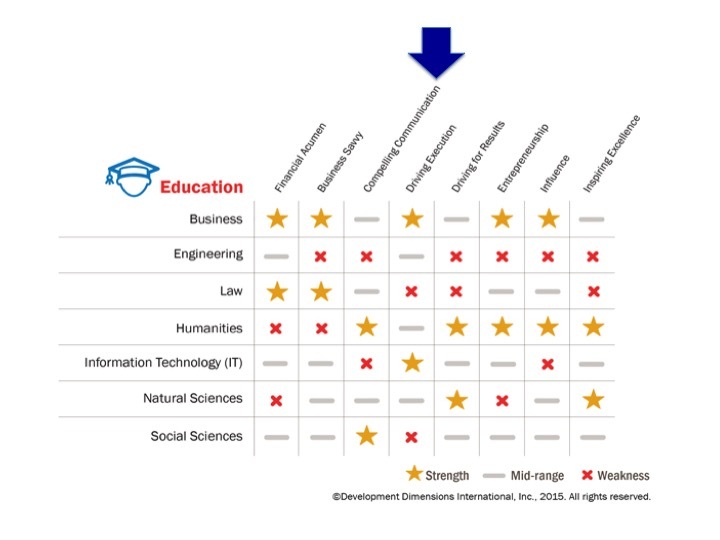 DDI’s study of the critical leadership skills as related to educational background illustrates the dearth of attention on this important topic. Two studies add insight into the scarcity of persuasive communication. 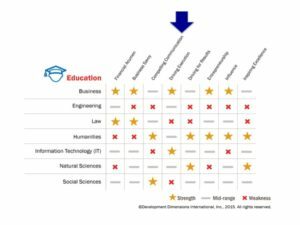 Second, in a 2016 study done by Payscale, managers reported on skills missing in new graduates entering the workplace. The chart below shows what they reported. These deficient skills are troubling because when the lack of writing, speaking, critical thinking and detail skills are combined they form the basis of the ability to communicate persuasively. One of these skills alone is insufficient. For example, public speaking is central to persuasive communication but the ability to speak in front of people is not sufficient by itself. Comedians are comfortable speaking publicly but comedians are entertainers, who are trying to make people laugh, not change. The fact that critical thinking and attention to detail are the top two missing soft skills indicates that underlying the inability to write and speak is a lack of organization and logic. This is alarming for generations of future leaders because people who cannot speak or write persuasively will find it difficult to lead others. 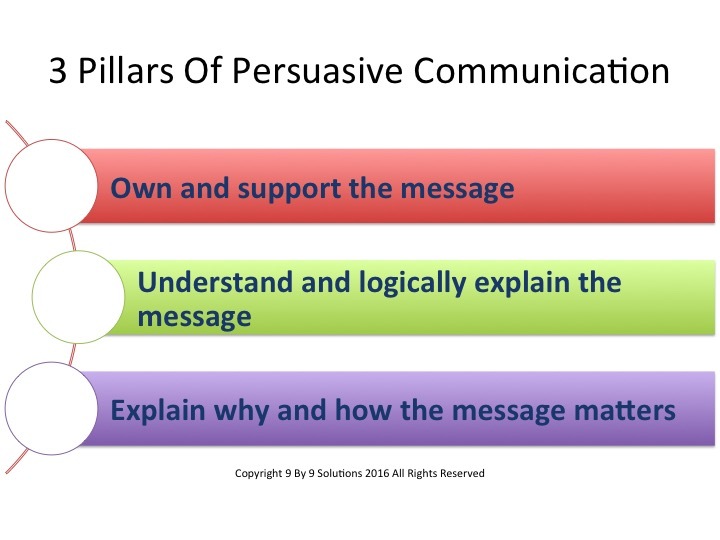 Persuasive communication is essential to leadership because it is the means by which leaders attract and gain followers as well as one of the main reasons followers stay with their leaders. Simply owning and supporting the message is not enough. Leaders must be able to explain the message in a logical way. (This is where detail and critical thinking come in to play). I can remember a situation years ago when I was conducting leadership training in which a participant was reporting on the work her group had done. She started in the middle; rambled around their plan and left everyone in a complete state of confusion. I can remember thinking at the time that this person would have serious problems in ever trying to lead people. a. The leader knows and understands the concept well. b. Sufficient planning has occurred to make the vision a reality. There is nothing that diminishes persuasiveness quicker than a message that is confused or illogical. When presenting the message, the leader should consider using one of the following formats so that people create a clear mental picture of what is being [resented. In addition the leader should use transitions between main points and summarize periodically so people will understand where they are in the message, what has been covered and what is next to come. There s a typical pitfall for leaders at this point. Often a leader thinks the message through in their head and it makes perfect sense and is logical. Yet when the presentation is made leaders find themselves stumbling and confused. Delivering a message in a logical way is more difficult than imagining the message in one’s mind. It is not always possible, but when a message is important leaders serve themselves well to practice their presentation beforehand to ensure it is as logical as it appears in their brain. People may hear a message but they will not engage if they do not think that or understand how the message is important to them. Many leaders take this personal application for granted. “If it is important to the company it is important to you”. These leaders believe that others should intuitively realize how and why a message is important. This is a major mistake in persuasive communication. It is critical that leaders provide a bridge: a pathway between what the message is and why it is important to the individual, the team and the organization. It is a major mistake to take the understanding of the bridge for granted. The result of ensuring these three elements of persuasive communication are done well is that it plants a seed of confidence. People have rationale on which to engage with the message because what was presented is a legitimate effort that is feasible and logical. 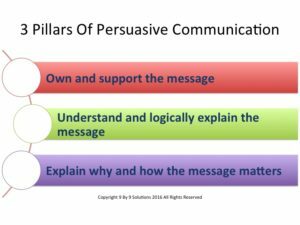 Persuasive communication cannot make up for the inadequacies of a poor decision or plan but poor persuasive communication can derail a good plan or decision. Persuasive communication can make the difference between success and failure, the difference between commitment and apathy. 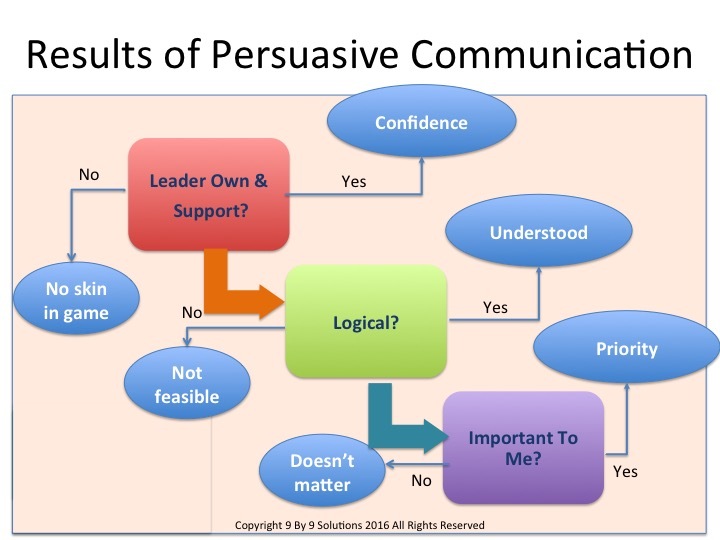 Persuasive communication is almost impossible for the negative or skeptical leader. Over time persuasive communication, when coupled with execution of what is proposed, enhances the trustworthiness of the leader while persuasive communication with faulty execution diminishes credibility and ultimately trust. For many leaders persuasive communication does not come naturally. It takes time to develop and hone this skill which is becoming rarer in the workplace. When persuasive communication is a part of a genuine and authentic leadership style it becomes one of the most powerful leadership tools in the leader’s toolkit. Leadership Nugget #16: Leadership Development Pipelines? You Have To Be Kidding!